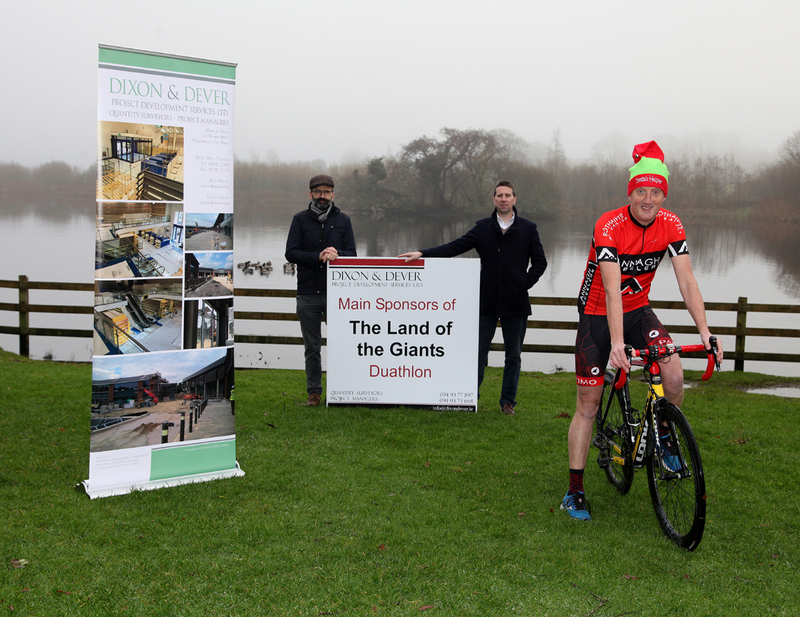 7th edition of Land of the Giants Christmas Duathlon to take place on 28th December 2018! The Land of the Giants Duathlon is just around the corner. The first round of the Ireland West Duathlon series is sure to be another sell out event with participants from all over the country converge on Claremorris for the December 28th run bike run event. Whether it is to kick off the season or to burn off some of those Christmas calories, it’s promised to be a most enjoyable event and a chance to catch up with old friends and make new ones. Past participants have often echoed that their run around Mc Mahon park and Clare lake goes like Fee-fi-fo-fum from the horrors of over indulging. Event organiser, Padraig Marrey of Raceface Events has said numbers are increasing every year and even the cold weather of last year still doesn’t deter entrants. The event is sure to be a sell out with over 400 participants. 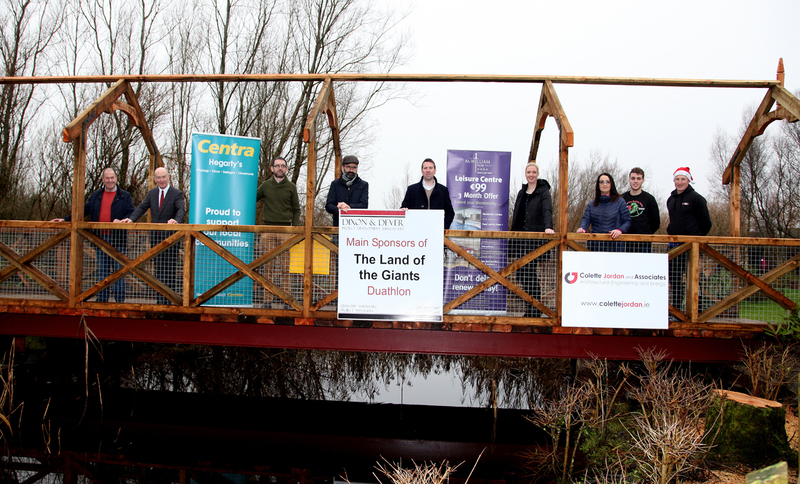 At McMahon Park Claremorris , was the launch of The Land of the Giants Duathlon which will take place in Claremorris on Fri Dec 28th. Pictured were Paul Dixon and Sean Dever of Dixon & Dever, Project Development Services Ltd. (Claremorris) who are main sponsors. Also pictured was Darragh Delaney(Annagh Wheelers). Marrey puts the successful entry figures down to early promotion and great support from local traders, especially Claremorris Chamber of Commerce. Dixon & Dever Quantity Surveyors and Project Management Services are the main sponsor. The Claremorris Company has been a key supporter of the event since its inception back in 2011. “We are delighted to be main sponsor as it’s a great event for the town; I have taken part myself a few times and love the atmosphere it brings,” said Paul Dixon of Dixon & Dever. The event starts in the heart of Claremorris town with a 5k run that takes participants out to McMahon Park where they run around in the safe environment of the beautiful Land of the Giants Greenway. Stage two is an 18k cycle taking on the undulating roads of Mayfields and Carramore, before returning via the Ballinrobe road. The final stage is a 2k run around Clare Lake, then back to the finish line at the Square. Sign on (number collection) is from the Mc William Park Hotel on Thursday, December 27 from 6pm to 8pm and Friday morning from 7:30am to 9:45am. 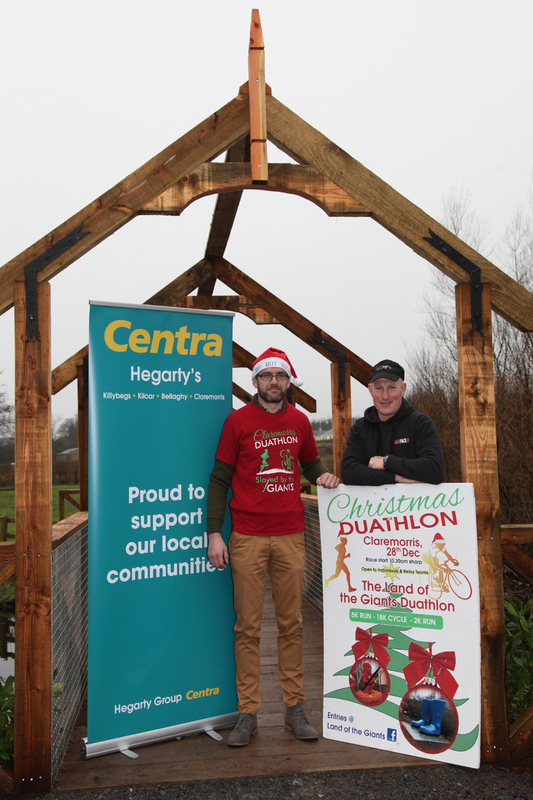 At McMahon Park Claremorris, the entrance to The land of the Giants Greenway, pictured at the launch of The Land of the Giants Duathlon to be held on Fri Dec 28th in Claremorris, were Sponsors with:Left to right: Sean Heneghan and Michael Brennan(Clare Lake Committee), Colm Byrne(Hegarty’s Centra Manager:Refreshments Sponsor), Paul Dixon and Sean Dever(Dixon & Dever: Project Development Ltd:Main Sponsors), Gemma Jordan(The McWilliam Park Hotel), Colette Jordan (Colette Jordan & Associates-Architectural Engineering and Energy), Colin Davitt(Bridge Signs), Padraig Marrey (Raceface :Organizer). Pic:Trish Forde. The Race briefing takes place at 10:15am at Market Square and the event starts at 10:30am sharp. Support sponsors The Mc William Park Hotel who will supply the post race refreshments. Hegarty’s Centra, Ballinrobe rd, Claremorris will provide all the finish nourishment. Claremorris Leisure Centre will provide shower facilities for participants after the event. Prize giving takes place at 12:45pm at the Mc William Park Hotel. Mr. Marrey thanked the sponsors and said the event would not be possible without the continued support of the main sponsor, Claremorris Chamber of Commerce, Mc Mahon Park committee, Mayo County Council, the Road Safety Authority, Claremorris Men’s Shed group and The Red Cross. Event results will be supplied by Core Timing. The event was launched at Mc Mahon park. 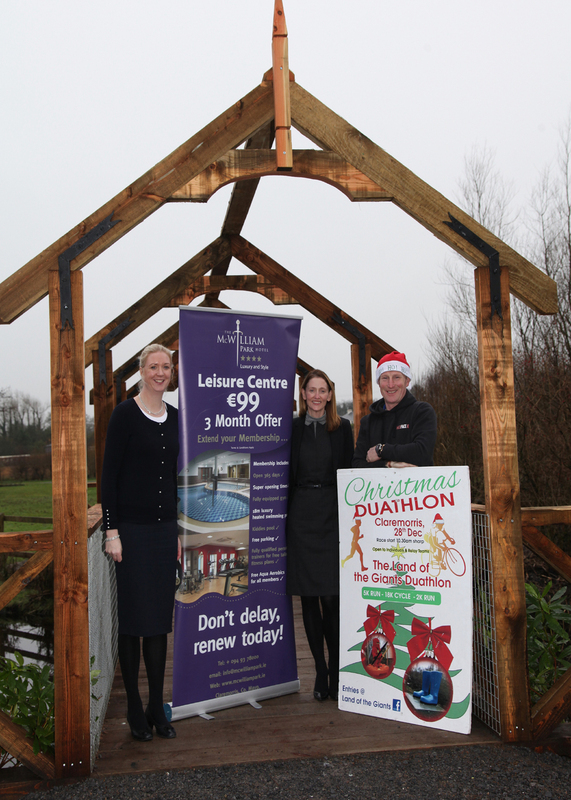 At the McMahon Park, the entrance to the Land of the Giants Greenway, pictured at the launch of The Land of the Giants Duathlon, to be held on Fri Dec 28th in Claremorris, were representitives of Sponsor The McWilliam Park Hotel, Gemma Jordan(General Manager), and Anne Bomser(Sales and Marketing) with Raceface, organizer Padraig Marrey. 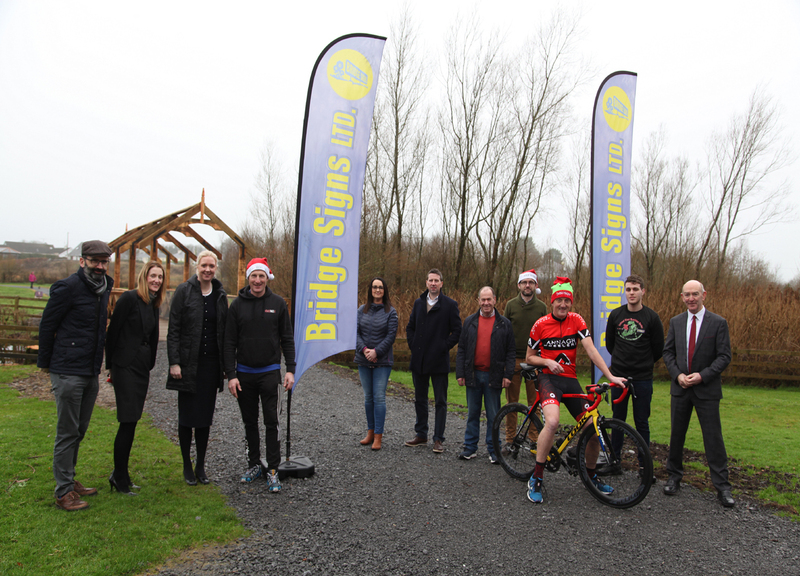 At McMahon Park Claremorris, the entrance to The Land of the Giants Greenway, pictured was the launch of the Land of the Giants Duathlon, which takes place on Fri 28th in Claremorris:Left to right:Paul Dixon(Dixon & Dever, Project Development ServicesLts:Main Sponsors), McWilliam Park Hotel , Sponors,representitives Anne Bomser and Gemma Jordan(General amnager), Raceface, Organiser, Colette Jordan(Colette Jordan & Associates -Architectural Engineering and Energy:Sponsor), Sean Dever(Dixon & Dever:Project Development Services Ltd: Main Sponsors), Sean Heneghan(Clare Lake Committee), Colm(Hergarty’s Centra Manager:Refreshments Sponsors), Darragh Delaney(Annagh Wheelers), Colin Davitt(Bridge Signs), Michael Brennan(Clare Lake Committee). Pic:Trish Forde. 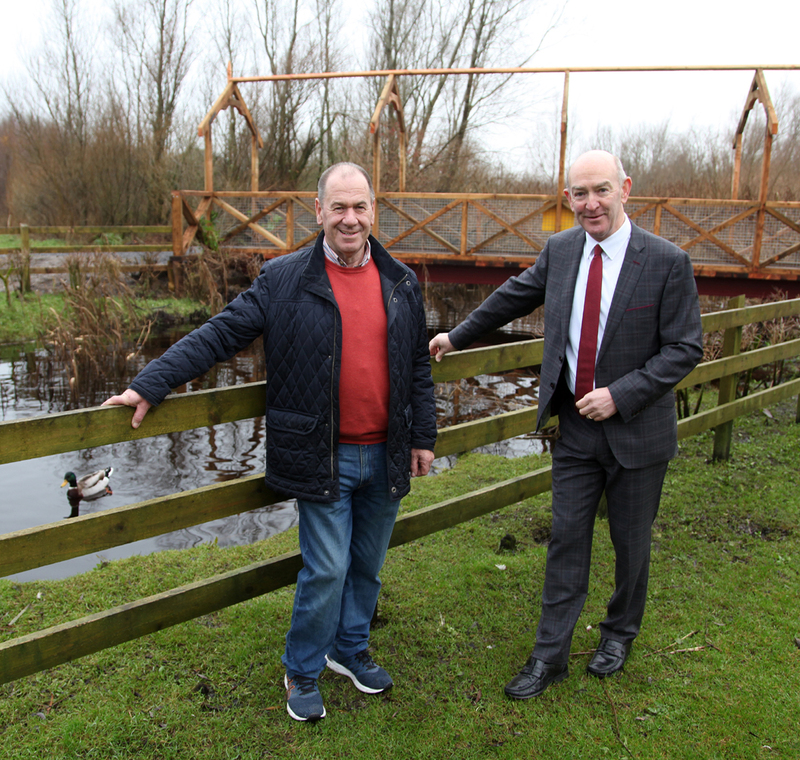 At the launch of The Land of the Giants Duathlon which takes place in Claremorris on Fri Dec 28th , pictured at McMahon Park Claremorris, were Clare Lake Committee members Sean Heneghan and Michael Brennan. 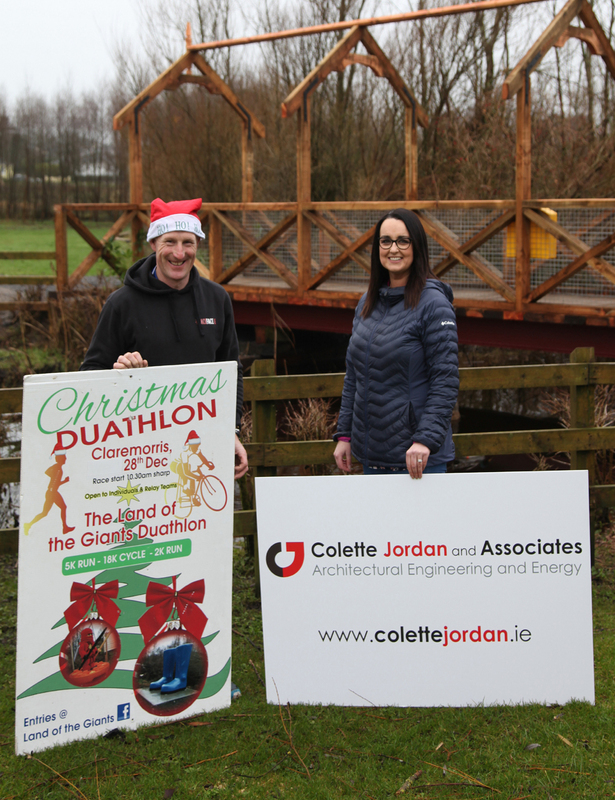 At the launch of The Land of the Giants Duathlon, which will take place in Claremorris on Dec 28th, pictured were Padraig Marrey, Raceface, Organizer, with Sponsor Colette Jordan of Colette Jordan and Associates, Architectural Engineering and Energy(Claremorris).